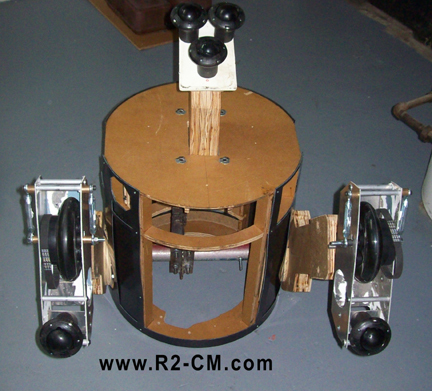 I made some more progress on K-9's drive system and the mounting systems are all but done. I also started shortening wires and adding permanent wire ends to everything. Also the fuse box is wired and operational. Next I will start on the other wheel assembly. 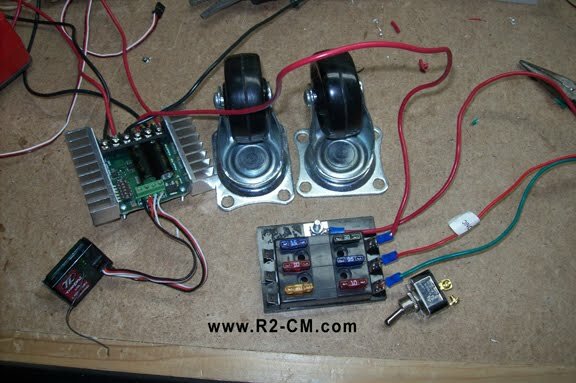 Volts, amps, and watts, oh my! First I started with putting his legs back on. Then I flipped him over and put his motor holders back on as well as his omniballs. Next I put his dome motor bracket back on and prepped the new lazy susan for installation. 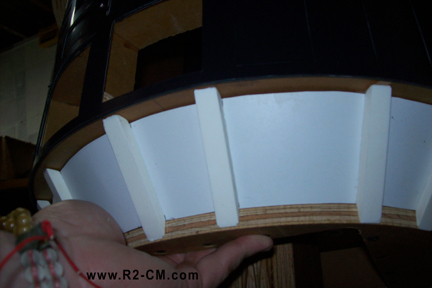 A new builder asked me a few days ago how to install the lazy susan correctly, so I will go into extra detail here. On the outer race, take out every other rubber leg and put some tape over the area around the hole so debris can not get in the bearing. Then find a drill bit that is the same size as the hole that the rubber leg was in. 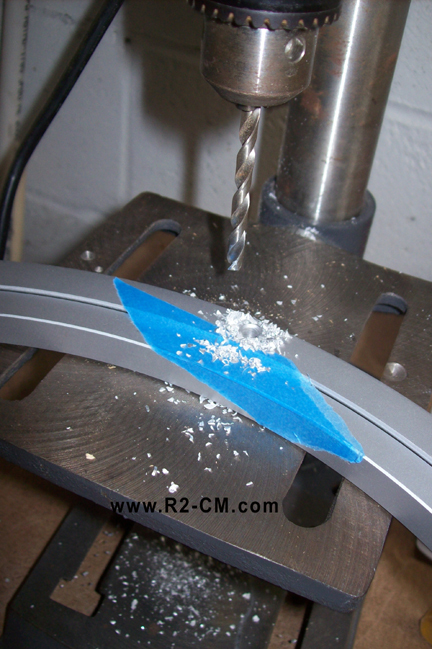 Carefully drill the hole all the way through the race so it comes out the other side. These holes will be use to mount the lazy susan to your frame. The inner race will have bolts to hold the dome on. The picture below shows what I am talking about. 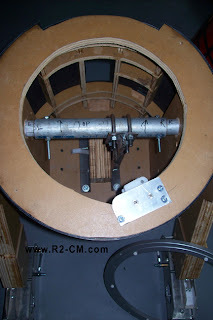 With the dome motor bracket installed is time to mount the lazy susan. 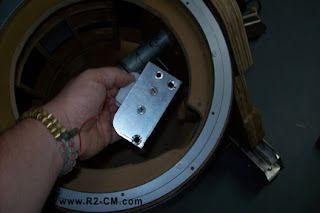 I still need to get the right sized bolts for the bearing so I will post pictures of that instillation later. With the top end together I put on ED's bottom end skirt. Just a couple drywall screws and it was done. Here he is standing back up on his own three feet. He still may not look like much bit at least he is together. Today R3 gets her new legs. Here is a before picture with her old ones. The old legs will go back on R4. Now that the paint has cured a few days I added the shoulder pieces back on with the new chrome strapping. 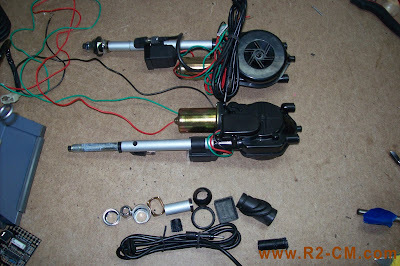 Next I took all the wiring out of the old legs and took off the motor holders and reinstalled them on the new legs. For the next part Denny came over to lend a hand so I did not mess up the new paint job. He held the body up on the center leg while I tinkered around putting the legs together. Then when everything was lined back up the muffler clamps were tightened back up. Here she is with her new black legs! Now I just need to add all the detail pieces as I get them done. Got a few odds and ends this evening for K-9. 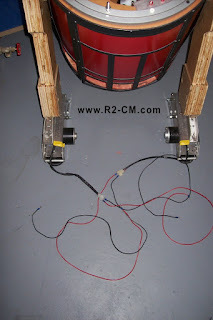 Some casters, a fuse panel, some aluminum to make brackets out of for the motors, threaded rods, extra wire connectors, fuses, and some switches. It is amazing how a few cheap items get expensive fast. There was a break in the weather though a bit on the windy side. I finished filling in R3's legs and sanding them. I then put two thin coats of Black on them. Once the wind dies down I will put on at least another coat or two before calling it a day. The Sabertooth came in this evening and I could not wait to wire it up. After an hour of stripping wire, soldering, and tightening everything down, I got his drive system up and running. Now I just need a body to attach everything to! I want to get at least one more to even everything out. Hmmm, who to get? 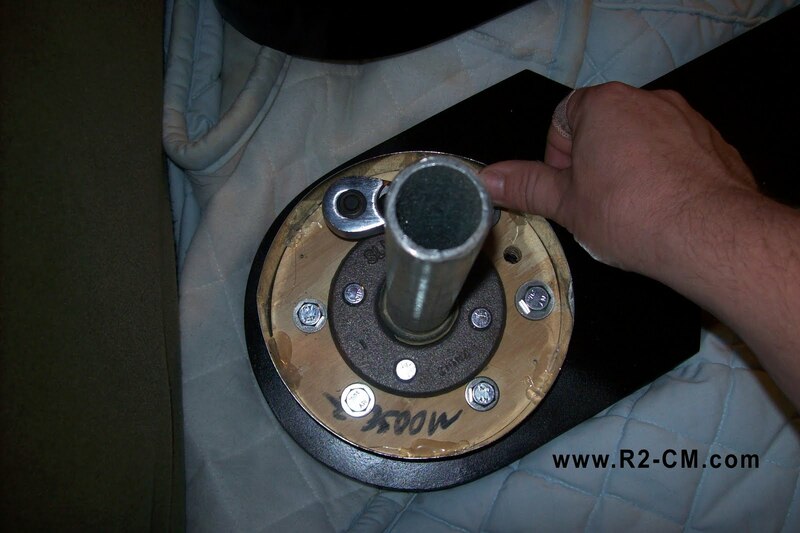 Today it warmed up a bit so I took R3's legs back out and did some more Bondo work to them. I got them half way done before the wind got to bad. As these legs will be painted black I took some extra time getting them smooth. Sand, fill, prime, sand, fill, prime, etc. I need to get them done this week as the cold Fall weather is about to set in. After a little finesse, I got the remaining hinges off of Patches Body. The old hinges are the small ones in the center of the picture below, they are great for small panels but not that accurate for long doors like the ones pictured. The new hinges have way more surface glue area and reinforcement to keep the doors working properly. I still have a bit of epoxy to remove from the inner skins before I mount the new hinges. I do not know yet if I will use epoxy again or try something else. 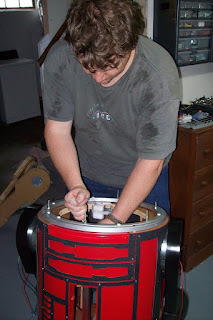 I also want to install some other servos while I got the doors off. I have noticed at the last few events that Patches has had a bit more of a lean than usual. I checked the markings on the inside pipe and there were off a little bit. The bolts holding the pipe were not to snug so the vibrations after all this time must have been letting the pipe move. I repositioned the pipe and tightened the nuts back down. Now he looks like he should. Once that was done I started taking the doors apart to install the new hinges. The top hinges came off easy but the bottom ones will not budge. I need to figure something out to get the epoxy to release. Once I have the doors off it will be much easier to add the rest of the door servos. Members of NASA were in town for a get together at the Local Air Museum. 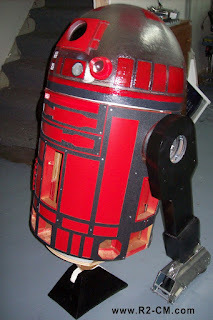 As the Pod racer is at the museum it was decided to have a Star Wars theme to the event. So the Central Garrison was nice enough to invite R2-Central and the Rebel Legion to come and help them out. 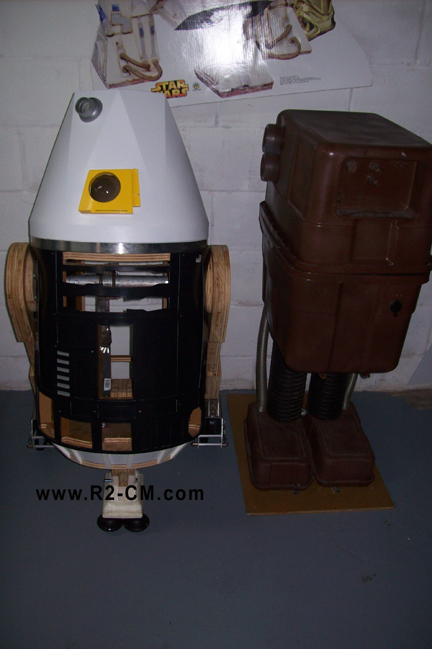 Here is R2-CM (Patches) and R5-TK hanging out before the event. Um...plane....behind you! The NASA members took a ton of pictures with all of us. Here is just one of many. Syrena and me with out wandering around with the droids in our Rebel Legion costumes. The camera could not take very good pictures where the Pod Racer was as it was a bit dark, but here it is. It is a full scale replica, the thing is huge! It was a great event. We got to meet a lot of friendly NASA people. One small step for man, one huge booster leap for droid kind. A lot of little things. I borrowed Big-D's and they barely fit inside but do clear all the machinery. Unfortunately they do not clear all the electronics of my removable RC setup. So I may have to make a dedicated system for him if I upgrade to the new batteries. Also I brought T3 inside for the first time this summer with everything connected and attached. He did not fit. Jen and I had to rotate his entire body twice just to get him past the side door. I wish I could re-size the door but the steps are in the way on one side and the wall is in the way on the other. These older houses were not built with robots in mind. I will figure something out.later, in the mean time I will just have to make due. Tonight I got K-9's tail together and animated. Here it is in the up position. I also got started on his neck articulation now that I got the proper tubing for it. Lots of brakets and reinforcements to make. No pictures today but I got my JAG hinges in today for Patches front long doors, they look great! Hopefully this week or next I can install them. Dawmer let me borrow one of his huge 12v 18amp lead acid batteries so I can see if they will fit in T3 with all his other electronics. (May try that out later) Thanks Big D! Jen found some screening that is very close to the right kind for K-9's ears while at the store. I started soldering and modifying the picaxe with only a few resistors and wires to go. Then comes the programing. Tomorrow it is supposed to rain all day so maybe I do not have to go to work. YA! 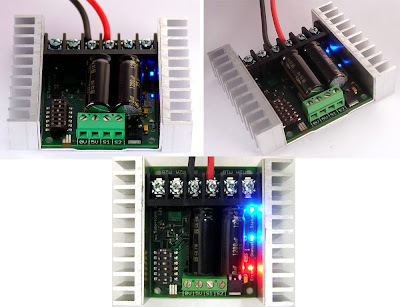 Ordered my first Sabertooth motor controller. Thought I would give one a try over the expensive VANTEC ones I usually use. 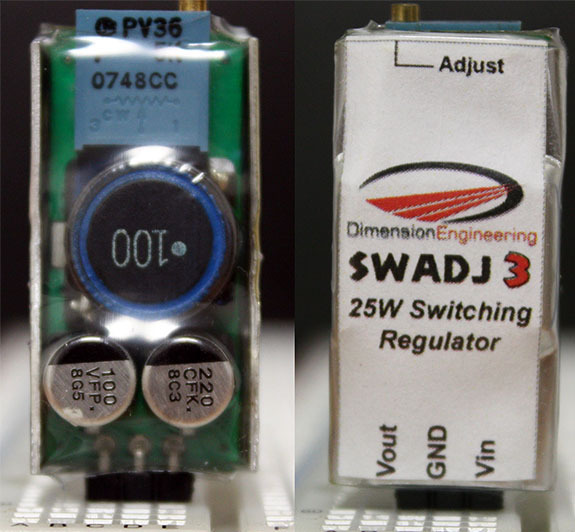 I also got some 5v voltage regulators for T3 for when I take the power supplies out of his head. Here is a video of how I did K-9's eye movement. I will also use a similar set up for Patches Life form scanner in the future. My newest 12 button remote came in this evening so I took some time to wire it up. 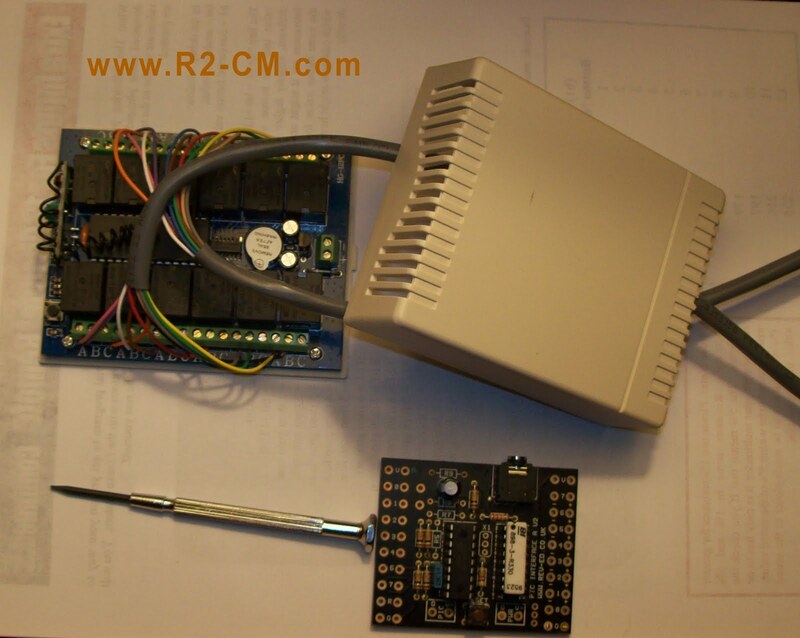 I noticed that in the two plus years I have been wiring these kinds of boards up my wiring has gotten a lot neater. It really helps to have a good screwdriver so you can get the clamps down tight without stripping the head of the screws. With everything wired up and color coded to each switch it is now ready to be attached to the Picaxe and some other future devices. More on that on my next update. Well it only took one night but K-9 is done! Well not really, but my small K-9 RC toy would like to think so. Here he is sporting some of big K-9's parts. I call it K-9 ZOOM ZOOM. 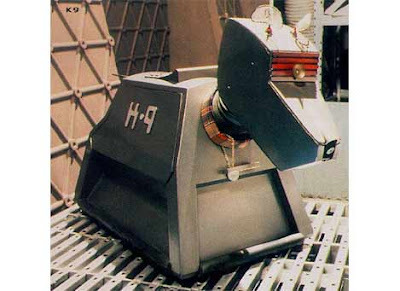 What I did get done tonight is a ton of research and looking at real K-9 pictures, then ordering some more parts like his tail, handles, and neck hose. I also took one of my car antennas and stripped it down to the bare minimum I needed. Here is a comparison of what it looked like before and after. No building going on right now but have been doing a lot of parts ordering. For Patches I finally got a hold of some JAG hinges for the long doors on the front. Hopefully this will help the doors shut more evenly. 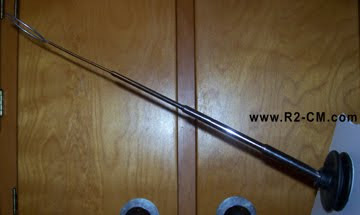 I also ordered a new 12 button remote for my K-9 project as well as some power car antennas. 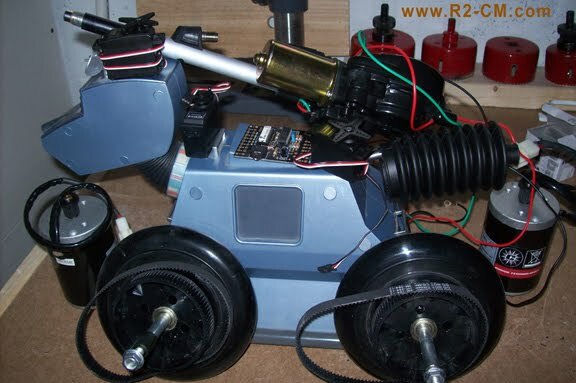 T3 is getting a slip ring so I can take the battery out of his head and use only one Picaxeinside his body instead of two (one in the head and one in the body). The Picaxe that is freed up will be used for K-9's systems. 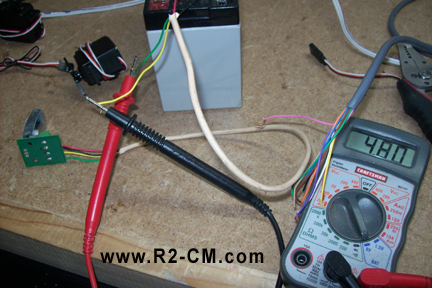 Other items I need to order are a higher amp battery for Patches transmitter, larger lead acid batteries for T3. A Saber-tooth dual motor controller and cheap 6 channel remote for K-9. 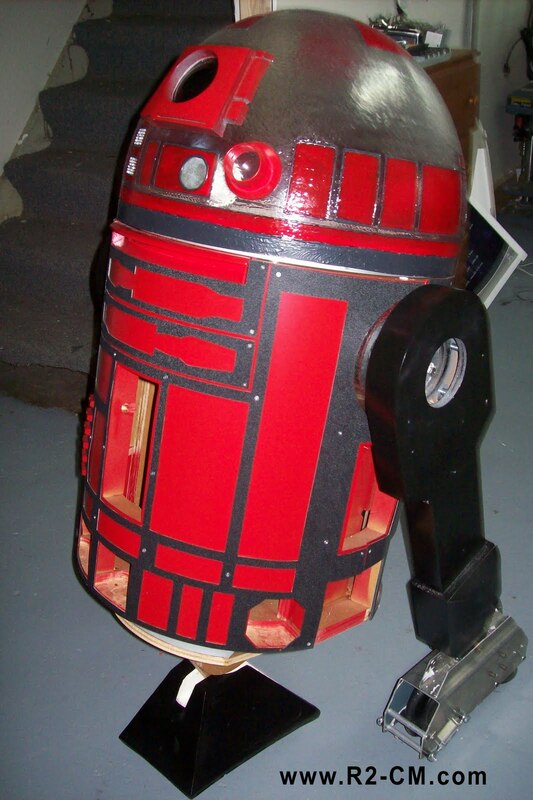 Also I will continue work on R3's legs so I can paint them before it gets to cold. Look at all the pretty levers! Lets pull one! After the event one of my friends kids walked in on me taking Patches apart. He was amazed. 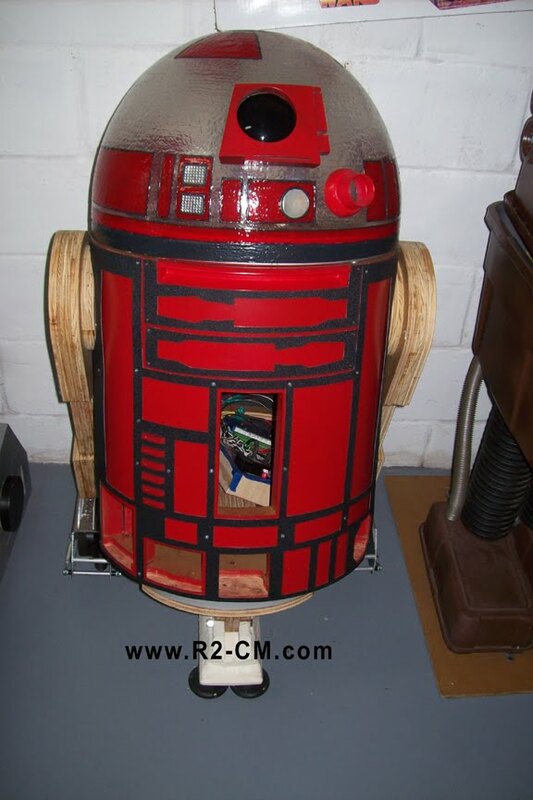 He looked at every piece of the droid with curious fascination. Future builder maybe? Here a quick video of the night. Vader closing his eyes and dreaming of flowers. 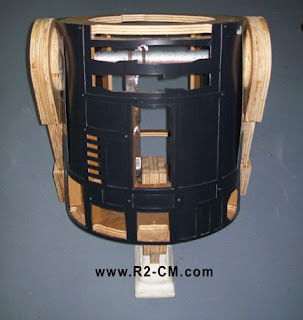 The rest of the droid builders 101 panel is up.